Taste test: These are good chips, but I should first warn you that they're not particularly hot. There's a bit of jalapeño taste and a mildly hot aftertaste, but they're much more cheese chips than they are hot chips. 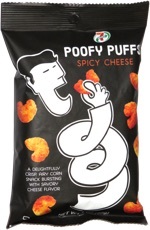 They've got tons of flavor powder on them, but the cheese taste is faily mild (and quite good) though not all that "sharp" as the name suggests. 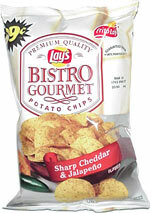 Another winner in the Bistro Gourmet line. Smell test: Very, very nice cheese smell. No jalapeño that I could notice. This snack was discovered by Jeremy in Somerville, Massachusetts.